It was hard for our little one to grasp the concept of right and wrong. That’s why we came up with the Goodness Tree to promote and reinforce positive behavior. With each act of good behavior, we add a new leaf to the tree. 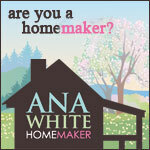 Find out how we created it! When bad behavior rears its ugly head, we remove leaves from the tree. When our daughter Sophia accumulates 20 leaves, she is rewarded with a small toy. When the tree is completely filled she gets a trip to Disney World! Some behavior examples that earn leaves are: getting ready for school and bed on time, picking up toys, eating all breakfast/lunch/dinner, daily chores, helping Mom or Dad, good listening and manners. 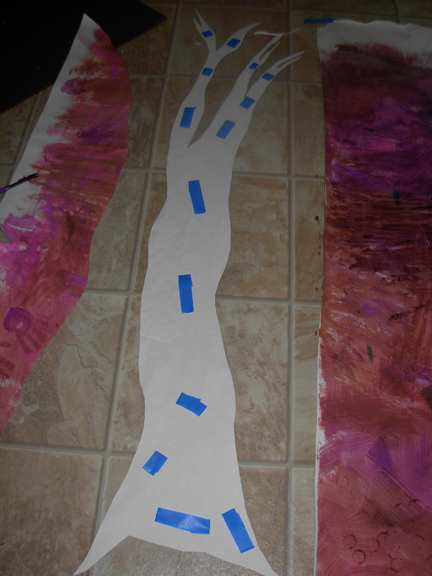 To start, we cut 2 long strips of paper from a roll of paper for the tree trunk and branches. Size of sheets can vary. We wanted it to fit on the back or our garage door that faced into our kitchen. Mix the paint for the tree trunk and branches. 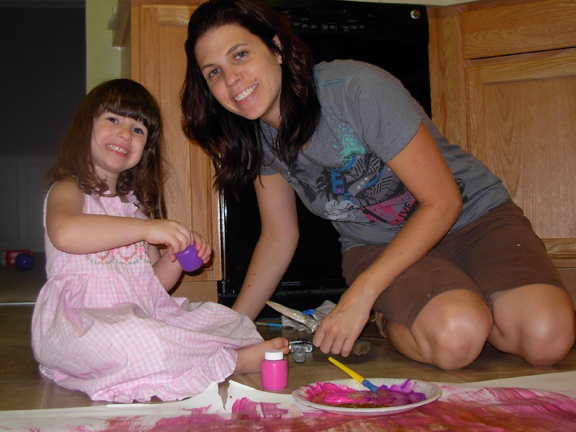 We used crayola washable paint, but you can use any waterbase paint. Our little one is such a girly girl we mixed brown, purple and pink. 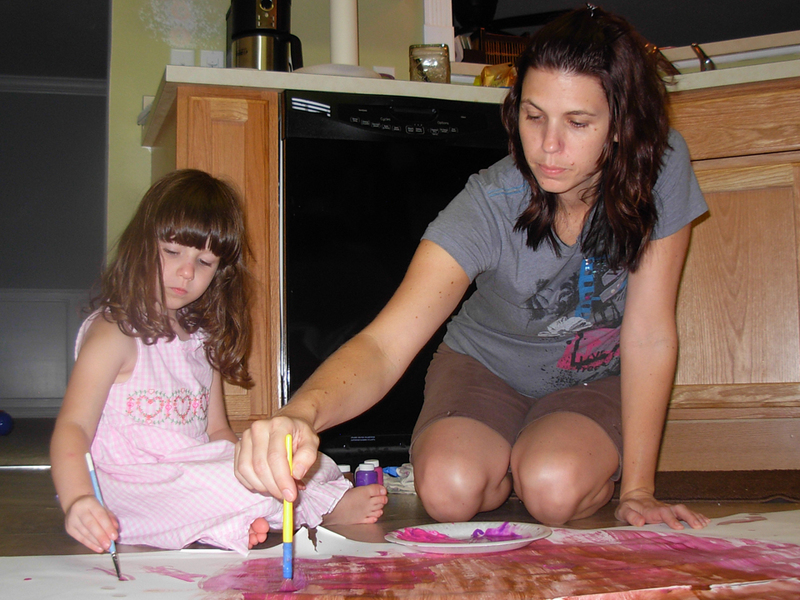 The sky’s the limit with this project, so let your little one(s) go to town painting. Getting them involved from the get-go helps reinforce good behavior. 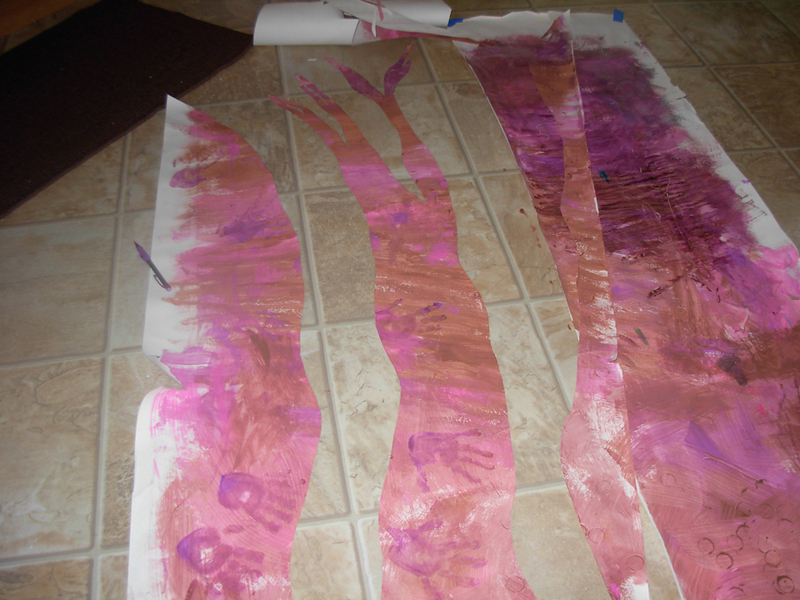 We painted brush strokes every which way, added her handprints and turned the empty bottles of paint over and used them like a stamp to create circle textures on the page. 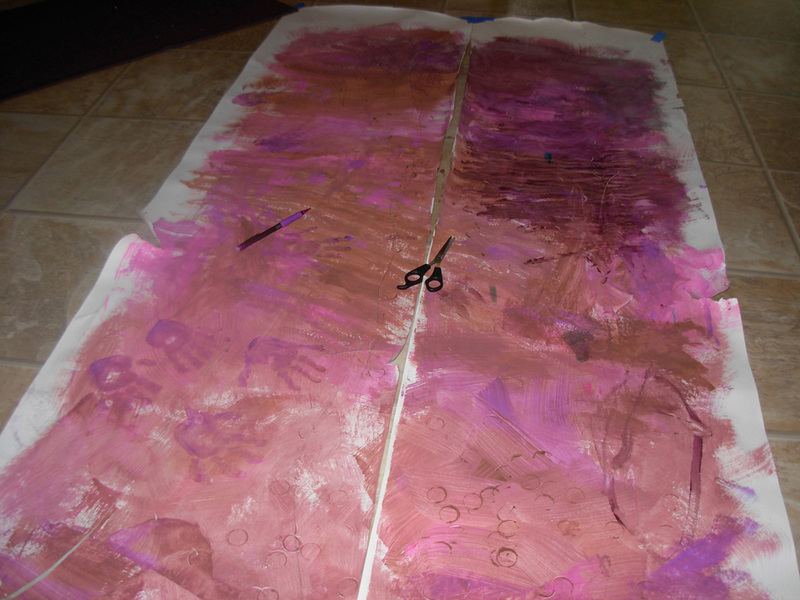 We made sure to cover the both sheets of paper with paint. 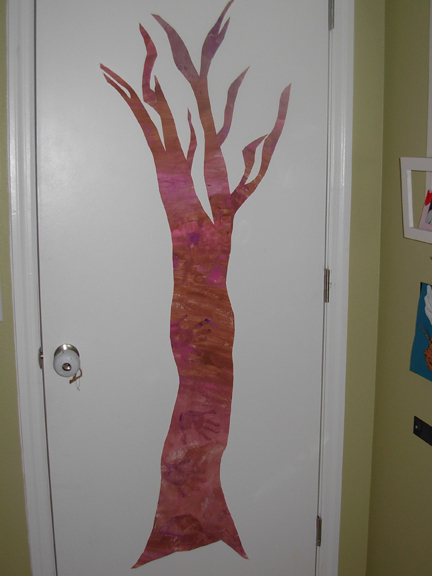 Once the paint is dry, use a pencil to freehand the tree trunk and branches. Cut the tree trunk and use the left over paper to cut branches out. Taped the back of the tree with Scotch painter’s tape. 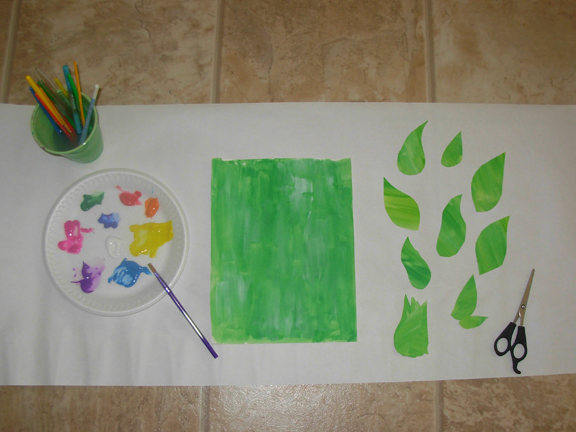 We painted the leaves the same way we painted the tree and branches by covering the entire sheet of letter-sized paper with green paint. 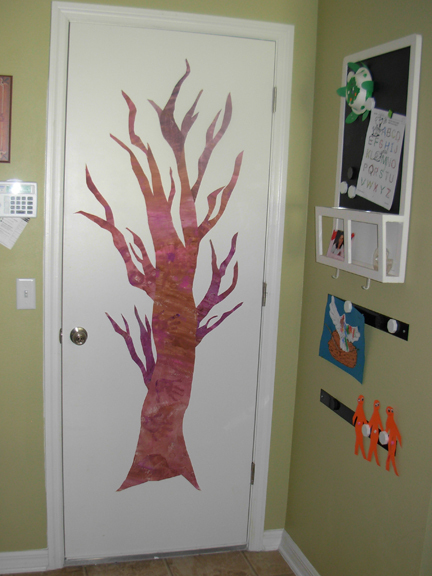 We painted 3 sheets, let it dry and cut out the leaves. It works! 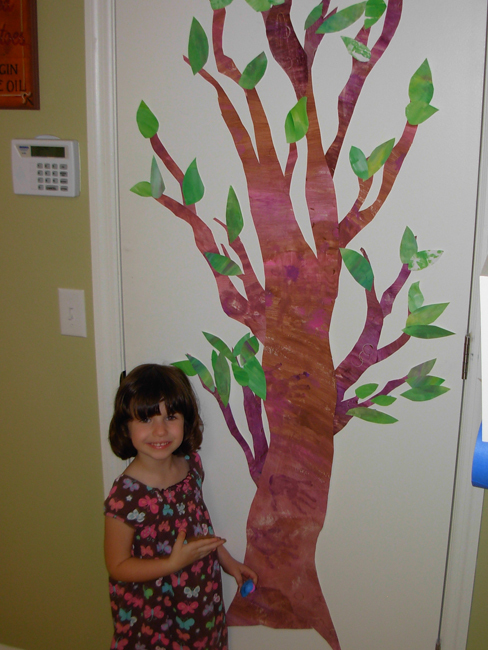 Since we started, Sophia earned total of 68 leaves (last updated 3/29/011). No, sorry, I do not have a Facebook fan page yet. 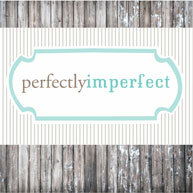 I will be getting that and Twitter up and running soon. Thanks visiting. You are so talented and smart! And have such an artistic, and creative way of looking at, and doing things! Also, your girl is beautiful!!! <3 yas! Aww, Thanks! That is so sweet of you to say that. I’ve seen some of your Photoshop work, you have creativity buzzing in your brain too. Keep at it. 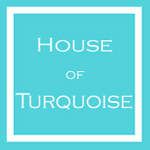 Thanks for taking a peak at our site. This is GREAT!! I would have done this project w/ the boys back when they were little in a heartbeat! This is a really cute way of learning! You really are, as the other commenters said, creative & smart. Sophia is as lucky to have you & J for parents as y’all are to have her!